To add up a column or row numbers in a table, use the Formula command. Click the table cell where you want your result. Click the Table Tools Layout tab and click Formula. Check between the parentheses to make sure Word includes the cells you want in the sum. =SUM(ABOVE) adds the numbers in the column above the cell you’re in. =SUM(LEFT) adds the numbers in the row to the left of the cell you’re in. =SUM(BELOW) adds the numbers in the column below the cell you’re in. =SUM(RIGHT) adds the numbers in the row to the right of the cell you’re in. If you make changes to the numbers you’re adding, select the sum and press F9 to show the new results. You can also use more than one formula in a table. For example, you can add up each row of numbers in the right-hand column, and then you can add up those results at the bottom of the column. 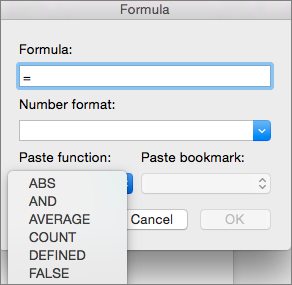 Word includes other functions for tables—for example, AVERAGE and PRODUCT. 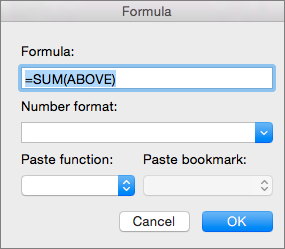 In the Formula box, delete the SUM formula, but keep the equal sign (=). Then click the Paste function box and click the function you want. Type ABOVEto include the numbers in the column above the cell you’re in and click OK. Type LEFT to include the numbers in the row to the left of the cell you’re in and click OK. Type BELOW to include the numbers in the column below the cell you’re in and click OK. Type RIGHT to include the numbers in the row to the right of the cell you’re in and click OK. Tip: To include a more specific range of cells in a formula, you can refer to specific cells. Imagine each column in your table has a letter and each row has a number, like in a Microsoft Excel spreadsheet. For example, to multiply the numbers from the second and third columns in the second row, type =PRODUCT(B2:C2). 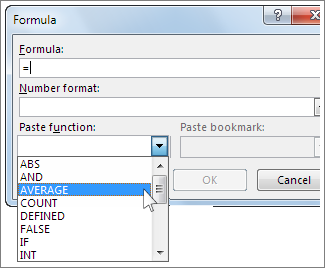 To add up the numbers in a column or row, use the Formula command. On the Layout tab next to the Table Design tab, select Formula. If you make changes to the numbers you’re adding, select the sum and press fn + F9 to show the new results. You can use more than one formula in a table. For example, you can add up each row of numbers in the right-hand column, and then you can add up those results at the bottom of the column. On the Layout tab next to the Table Design tab, click Formula. Type ABOVE to include the numbers in the column above the cell you’re in. Type LEFT to include the numbers in the row to the left of the cell you’re in. Type BELOW to include the numbers in the column below the cell you’re in. Type RIGHT to include the numbers in the row to the right of the cell you’re in. If you’re familiar with the desktop version of Word, you know you can use formulas to perform calculations such as summing a column or row of numbers in a table. Word Online preserves formulas already in your document, but it doesn’t yet provide a way to add them. 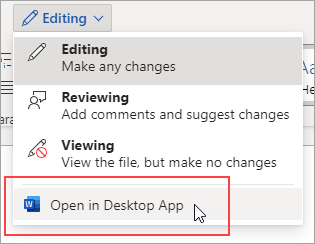 If you have the desktop version of Word, use the Open in Word command to open the document and insert the formula. When you’re done and you save the document, it will continue to store the formula when you open it in Word Online.